In Consumptive Chic: A History of Beauty, Fashion, and Disease, Carolyn A. Day investigates how the fatal symptoms of tuberculosis became entwined with feminine ideals in the late 18th and early 19th centuries. Anne would die in 1849, at the age of 29; Emily had died in 1848, at the age of 30, both from what is now recognized as tuberculosis. But why was such a deadly fate ever considered “flattering,” as Charlotte noted? 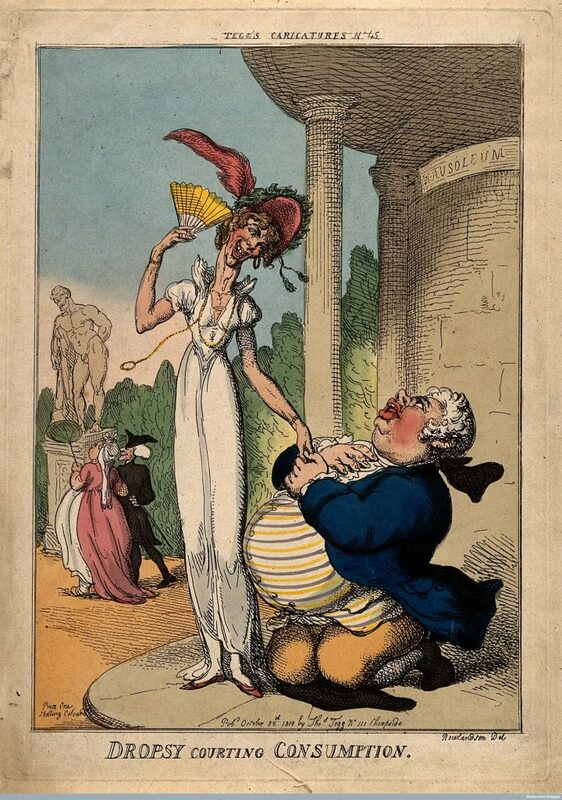 The strange entwining of the symptoms of tuberculosis with women’s fashion in the late 18th to mid-19th centuries is explored in Carolyn A. Day’s Consumptive Chic: A History of Beauty, Fashion, and Disease, recently released by Bloomsbury Academic. “How is it possible that a disease characterized by coughing, emaciation, relentless diarrhea, fever, and the expectoration of phlegm and blood became not only a sign of beauty, but also a fashionable disease?” Day, an assistant professor at Furman University in South Carolina, asks in an introduction. In the subsequent pages of her slim book, illustrated with fashion plates and examples of corsets and dresses that emphasized emaciated collar bones and encouraged a stooped posture, Day explores the evolution of the scientific understanding of tuberculosis, along with its influence on beauty. 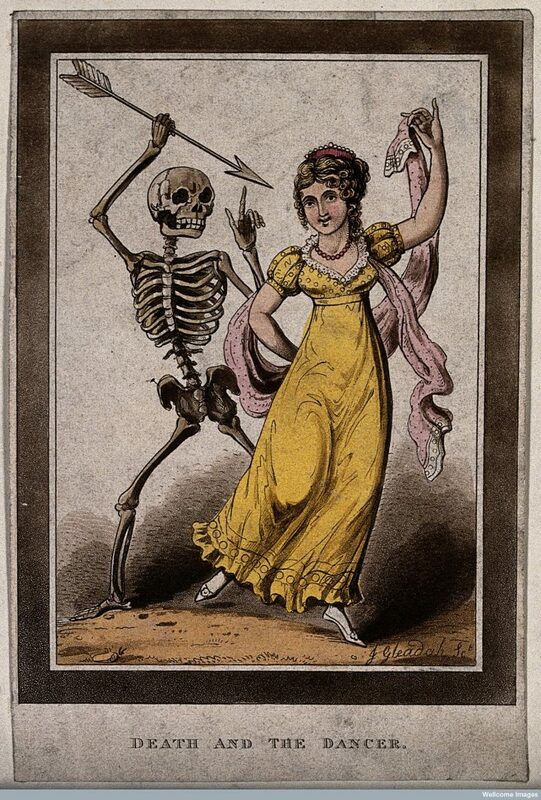 She concentrates on the years between 1780 and 1850, when at its peak tuberculosis caused around 25 percent of deaths in Europe, even as it was glamorized. It helped that the wasting away of tuberculosis sufferers aligned with existing ideas of attractiveness. The thinness, the ghostly pallor that brought out the veins, the rosy cheeks, sparkling eyes, and red lips (really signs of a constant low-grade fever), were both the ideals of beauty for a proper lady, and the appearance of a consumptive on their deathbed. If you didn’t have the disease, you could use makeup to get the pale skin and crimson lips, and wear a dress that slumped your posture. Other major diseases of the day, like smallpox and cholera, could be much more gruesome and disfiguring, and were not depicted as gently. Art and literature affirmed this perception. 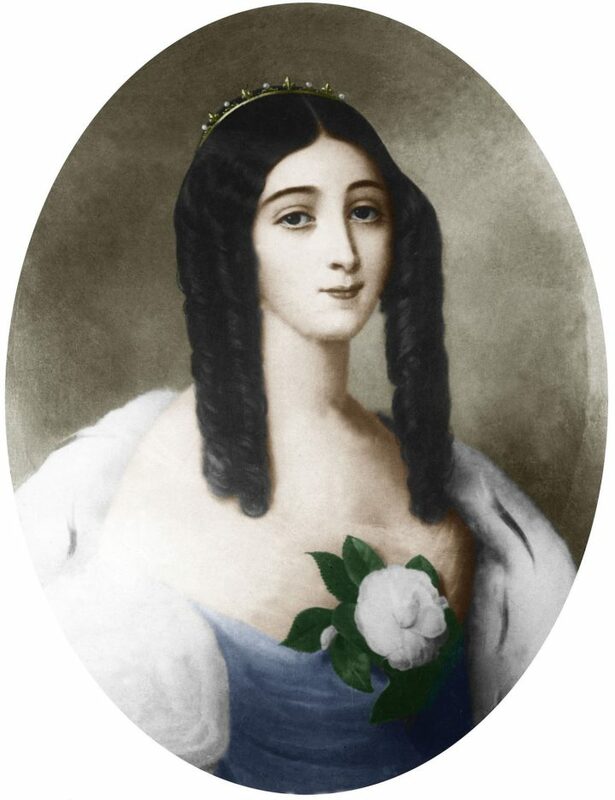 The 1850s opera La Traviata, had as its protagonist the consumptive Violetta, inspired by the French courtesan Marie Duplessis, who died of tuberculosis in 1847 at the age of 23. 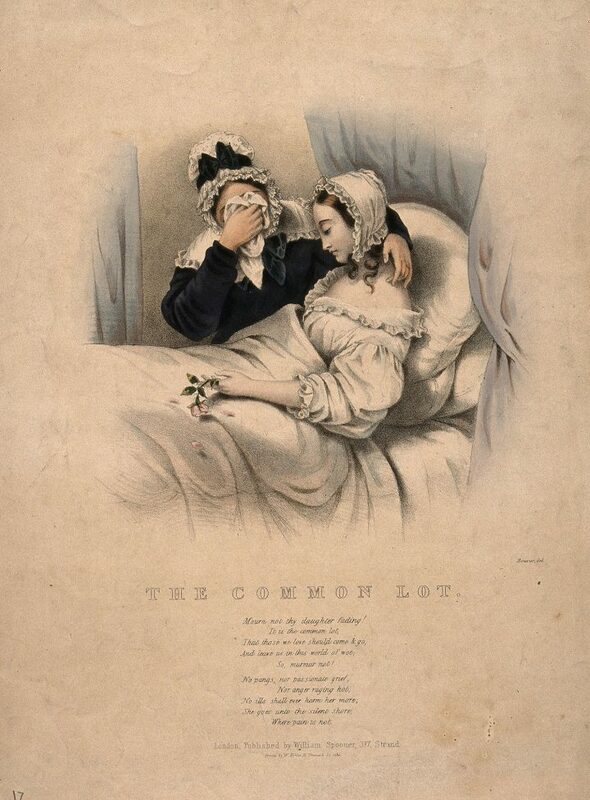 The young diarist Emily Shore, who died at the age of 19, was portrayed in her bed in an engraving. Beside her is a bird, perhaps signaling that soon her soul will take flight. Fashion plates even shaded in the space between the shoulder blades to give them a desirably bony look. As Day notes, “tuberculosis” only appeared in print in 1839. Instead names including phthisis, consumption, scrofula, hectic fever, and graveyard cough identified its emaciation and decline. Although tuberculosis was an epidemic across classes, and genders, it became associated with respectable women. Part of this was a belief in being born with an inclination to the disease, which could be triggered by too much dancing or mental exertion (hence its attachment to literary “genius” in men who died of it, like the poet John Keats). Only in the later 19th century would it be recognized as the contagious bacterium Mycobacterium tuberculosis (MTB). “Sanitary reform, plus social concerns, combined to transform tuberculosis in the latter half of the 19th century from a condition presented as conferring beauty and intelligence into a biological evil that was the product of social conditions that could and should be changed and controlled,” Day writes. For instance, the long trains of early 1800s neoclassical-style dresses, with high waists and diaphanous fabric that were not dissimilar from nightgowns worn by the dying, were later shortened when it was thought they might drag in these contagions from the street. The light fabrics, which framed exposed clavicles and skeletal shoulder bones, were rightly seen as terrible for the often damp and chilly English climate. The later use of separate parts in corsets, such as the steam-molded corsets of the 1860s, also moved fashion away from the willowy waists of “tubercular chic” into a curvy form believed to be more healthy. As tuberculosis waned in its positive associations, it became more connected to poorer classes; health became a marker of privilege. Day doesn’t delve into the larger history of frail, diseased women being idealized in fashion (see the ’90s era of heroin chic, or even the glamorous wasting of the character Mimi dying of AIDS in the 1996 musical Rent, an echo of her tuberculosis-afflicted inspiration Mimì in the 1896 opera La Bohème). Women as deathly thin, delicate, fragile, and sickly, as something to be cared for by men, remain a fashion fetish. Yet there’s also something somber behind all the curious fashion choices, the Romantic paintings of women as pale as marble, such as Thomas Gainsborough’s 1770s portrait of a sallow “Honourable Mrs Graham” before her untimely death from the disease. In making this harrowing illness into something aesthetically desirable, families could find some sense in a loss that felt too soon, too sudden, too meaningless. Consumptive Chic: A History of Beauty, Fashion, and Disease by Carolyn A. Day is out now from Bloomsbury Academic.